In the week of the 25th anniversary of THAT match against West Germany during Italia ’90, we look at the subsequent international careers of the players to feature that night (plus a brief rundown on the other members of the squad). Of the 12 players used by England against West Germany, stalwart defender Terry Butcher was the only one who did not win another cap for his country. First capped a decade earlier, Butcher had gone on to make 77 appearances and feature prominently in three World Cup tournaments. The end of Italia ’90 marked a natural conclusion to his international career at the age of 31. Four months later he became player-manager of Coventry City. It came as little surprise when goalkeeper Peter Shilton retired from international football at the end of the tournament after 20 years and a record 125 caps. His final match would be the third place play-off defeat to Italy in Bari three days after the West Germany clash, as he bowed out at the age of 40. That Italy match would also bring the curtain down on Bobby Robson’s memorable eight-year reign in charge of England. Reserve goalkeeper Dave Beasant was never capped again, while Steve Bull (two more caps) and Steve McMahon (one more cap) never played for their country after 1990 was out. A regular under Bobby Robson, winger Chris Waddle would not enjoy the same prominence under Graham Taylor. The Marseilles player played in the first two matches of Taylor’s reign but he had to wait a year for his next cap – a Euro ’92 qualifier against Turkey in October 1991 which proved to be the end of his England years with a total of 62 caps. That Turkey match also marked the end of the long England career of Bryan Robson after 90 caps – just three coming under Taylor. Earlier in 1991 Steve Hodge won his final two England caps as he bowed out with a total of 24 appearances to his name. The only English player to come off the bench in the semi-final against West Germany, for several years Rangers midfielder Trevor Steven seemed to be a permanent fixture in the England squad without cementing a regular starting place. He would have to wait until February 1991 to earn a cap under Graham Taylor and won just seven more in total before his international career ended against France during Euro ’92, with 36 appearances to his name. 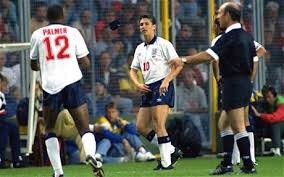 Gary Lineker’s England career ends in anti-climatic fashion in 1992. 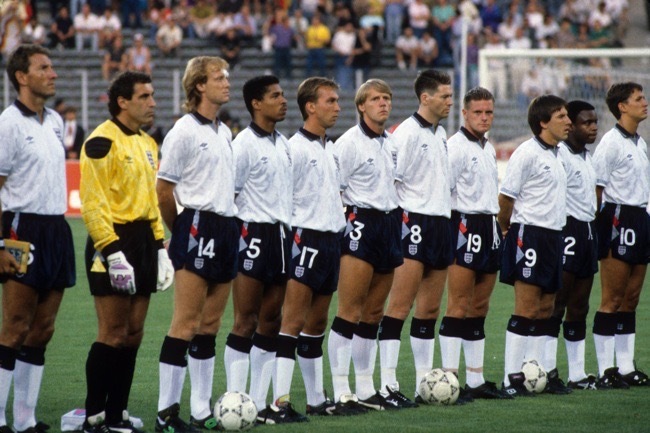 The 1990 World Cup saw Gary Lineker score four times and he had further good news a few weeks later when he was named captain for Graham Taylor’s first match in charge against Hungary (Bryan Robson was injured and previous deputies Terry Butcher and Peter Shilton had retired from international football). Lineker scored the only goal and he would enjoy a good season in 1990-91 as he closed in on Bobby Charlton’s record of 49 England goals. His priceless equaliser away to Poland in November 1991 took England through to the Euro ’92 finals. That tournament would mark an anti-climatic end to Lineker’s international career (he had announced beforehand he would be quitting international football as he prepared to move to Japan), being unable to get the goal he needed to equal Charlton’s record and infamously being substituted in the decisive group defeat by Sweden. Lineker had played 22 times under Taylor, as he finished with a total of 80 caps. The defeat to Sweden also marked the end of Neil Webb’s England career with 26 caps – just six of them being won under Graham Taylor. Previous regular Gary Stevens won a mere five England caps under Taylor, the last being against Finland shortly before Euro ’92. One of England’s main success stories at Italia ’90 was Nottingham Forest defender Des Walker, who had broken into the side in the wake of the Euro ’88 debacle and become established in the centre of defence. He moved to Italy with Sampdoria in 1992 and remained a first-choice player under Graham Taylor. But in 1993 he was struck by a chronic loss of form that included him conceding a crucial late penalty equaliser against the Netherlands in a World Cup qualifier. His last England match would also be Taylor’s last – away to San Marino in November 1993. He won 34 of his 59 England caps under Taylor. Tony Dorigo won his 15th and last England cap in October 1993 against the Netherlands – he had played 11 times under Graham Taylor as he struggled to dislodge Stuart Pearce from the left-back spot. Goalkeeper Chris Woods won his last cap against the USA in June 1993 – he had won 27 of his 43 caps while Taylor was in charge as he initially became first-choice following Peter Shilton’s retirement. Another player to emerge with credit from Italia ’90 was QPR defender Paul Parker, who replaced previous regular Gary Stevens for the second match against the Dutch and remained in the side thereafter. Despite moving to Manchester United in 1991, Parker featured only sporadically under Graham Taylor – winning just seven caps under him. He started the first England match under Terry Venables against Denmark in March 1994 but was never picked again, finishing with 19 caps to his name. John Barnes ended his long England career in September 1995 against Colombia – of his 79 caps, 21 were earned following the 1990 World Cup. Derby County defender Mark Wright had forced his way back into the England squad in time for Italia ’90 and he enjoyed an excellent tournament. He stayed in the side as Graham Taylor took over and would deputise as captain against the USSR in 1991, but injury ruled him out of Euro ’92. After playing against Spain in September 1992, Wright – now of Liverpool – was left waiting until the spring of 1996 to get his next international cap under Terry Venables. He played in friendlies against Croatia and Hungary but missed out on being involved in Euro ’96 as he finished his England career with 45 caps and one goal. Popular Liverpool attacker Peter Beardsley would struggle to fit in under Graham Taylor, despite scoring a speculative effort in the 2-0 win over Poland in a Euro ’92 qualifier in October 1990. After featuring four times in 1990-91, Beardsley was stuck on 49 caps for almost three years until Terry Venables took over in 1994. Beardsley – now back at Newcastle – was recalled at the age of 33 and enjoyed an Indian Summer to his England career, winning 10 more caps. The last came away to China shortly before Euro ’96. Another player to come to the fore for England at Italia ’90, David Platt was to spend the next six years as a regular in the England midfield and often served their main source of goals. He won a further 51 caps and scored 24 more goals (leading to respective totals of 62 and 27). His ability was recognised with a move to Italy in 1991, enjoying spells with Bari, Juventus and Sampsoria. He was the only England player to score at Euro ’92 and four years later he was part of the side that again suffered heartache against Germany in Euro ’96. But Platt would never win another cap after Glenn Hoddle replaced Terry Venables following the tournament. The tears shed by Paul Gascoigne during the semi-final against West Germany led to ‘Gazzamania’ taking hold across the nation in the months that followed. He would win Sports Personality of the Year for 1990, while in 1992 he completed a big-money move to Lazio after recovering from serious injury. He stayed part of the England set-up for eight years but injuries limited him to just 40 more caps. The only major tournament he would feature in after this was Euro ’96, scoring a never-to-be-forgotten goal against Scotland. With the 1998 World Cup beckoning he was sensationally dropped from the tournament squad from Glenn Hoddle and never picked again – meaning his last cap was against Belgium in Morocco in May 1998. He finished with 57 caps and 10 goals for his country. Stuart Pearce banishes the memory of his penalty miss during Italia ’90 by scoring against Spain in Euro ’96. 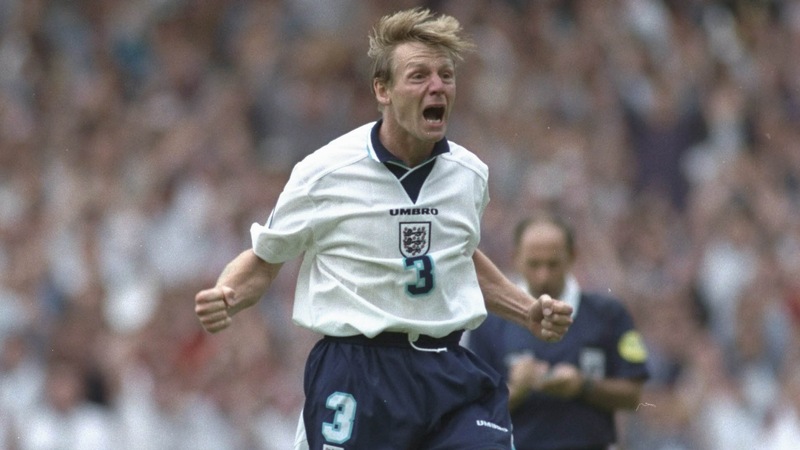 If England took to the field during the 1990s, there was a fair chance Stuart Pearce would be playing at left-back. Despite the blow of missing a penalty in the shoot-out loss to West Germany, Pearce had otherwise enjoyed a decent World Cup and the Nottingham Forest defender would later feature during Euro ’92 and Euro ’96 – the latter seeing him exorcise memories of the 1990 penalty miss by scoring in shoot-outs against Spain and Germany. Pearce appeared to have ended his England career in 1997 with 76 caps, but in September 1999 the 37-year-old played against Luxembourg and Poland shortly after joining West Ham United. That proved to be the end of an England career that had brought appearances under five different managers – Bobby Robson, Graham Taylor, Terry Venables, Glenn Hoddle and Kevin Keegan. Pearce himself would later enter management, including a spell as boss of England Under-21s and being in interim charge of the seniors for a friendly against the Dutch in 2012. The first man to go home from the 1990 World Cup squad would ultimately be the last man standing for England in terms of their international career. David Seaman later became first-choice goalkeeper and won a total of 75 caps – all bar three coming after Italia ’90. His last cap was won as late as October 2002 against Macedonia.